Tilapia : The Buzz ! Fans of Tilapia flocked to our stand in the Nautic exhibition to see the new version "fun" of this atypical boat that has already sold more than 35 copies release. Tilapia was introduced in a fur made ​​of fish scales giving it an amazing look! With if you want a Torqueedo electric motor navigating clean and quiet! Distributor, Catway in La Rochelle, waiting for you to listen to your project! If you want with a Torqueedo electric motor navigating clean and quiet! 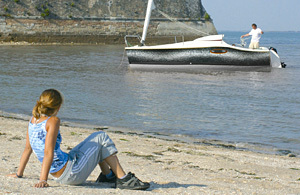 Distributor, Catway à La Rochelle, is waiting for you to listen to your project!